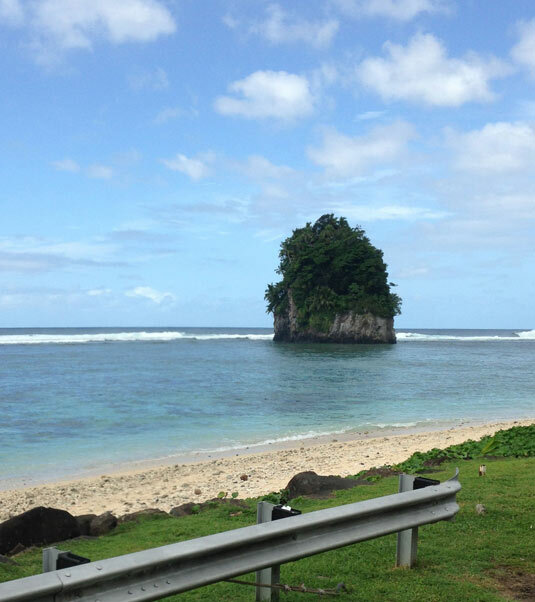 First, because of the weather and anchorage we were not fond of American Samoa (AS). We spent three fair length wind / weather events there which jailed us for the most part on the boat. The anchorage is quite messy. The water is quite dirty, the dinghy docks “sketchy”, and the people although friendly when approached seemed rather dour from afar. And…on top of all that, it rains constantly. We tried to get a tour of the Starkist Tuna plant and that went nowhere. Sandra ( Cassandra.Satele@StarKist.com ) was pleasant when we (Steve from Carolina Lady) and I went to visit and she passed us off to Mr Lavea ( Michael.Lavea@StarKist.com ) who, while he emailed a couple of times, never followed up and ignored both Steve’s ; from Lady Carolina, and my emails. We were a group of 9 with 3 middle school / high school aged children who would have benefited from the educational experience. In the end I even contacted Starkist USA through their website and emailed the General Manager: Sangdong Kwon ( Sangdong.Kwon@Starkist.com ) of Starkist AS who never responded either. I didn’t expect him to respond personally but not having any response from a secretary or from Michael was quite a disappointment. This experience makes me wonder what Starkist is hiding and personally I will now avoid purchasing any Starkist products when ever possible. In my life I’ve toured many manufacturing plants from Alcohol to Potatoe Chips and every company has been more than accommodating. Star Kist, for some reason, was not and all we received was a run around wasting our time and theirs. Shame on Starkist! The AS anchorage was slippery. While we were there 5 boats dragged with every type of anchor. A Rocna dragged twice, a Spade once, a CQR once, a Delta once and one large Navy 200 kg mooring anchor. Because of a switching wind no one deployed a Fortess or Danforth. We were lucky we never dragged but we came close. After hearing Steve’s tales of woe (sv Carolina Lady) we became a little worried about our own anchor and put out a Tandem anchor rig. I have a 60 lb CQR for the main anchor and we backed it up about 50′ behind with a 85 lb Luke fisherman. I figured even if the winds picked up enough to lift the Luke, it would be a heck of a kelt on the all chain rode. We were the third boat there to have a tandem rig deployed and none of the boats with two anchors deployed either as a tandem or a Bahamian moor ever dragged. One boat on a mooring broke free of the mooring and had to be removed from the shore via a tug ( insert link here). The middle of the anchorage appears the slipperiest and from all appearances the dragging is not all because of the bottom quality but because of what is on the bottom. When sv Lady Carolina dragged with the HUGE Navy anchor and he picked it up to re – deploy it he found, wire, plastic, clothing, and an old old bicycle with the anchor trip line all wrapped up. The tsunami from ’09 appears to have washed every item people leave in their yards into the harbor and with the water quality as murky as it is; to our knowledge, there has not been any effort to clean it up. I even watched other boats when cleaning their anchors to redeploy them just dropping what caused them to foul back in the water. Shame on them! When we picked up our anchor, the Luke on our tandem rig had wrapped some cloth around the shank. When we picked up the primary anchor the shank had a good size piece of plastic wrapped around the shackle. Had that plastic made it to the anchor horns we would have been moving across the harbor too! The flotsam has been taken ashore and disposed of properly! The best anchoring bottom in AS appears to be on the south 1/3 of the anchorage. If one is interested in wi-fi then stay as far east as you can and the Blue-Sky signal will be stronger. (There is a 30 ‘ bump in that area that has coral and m/v Domino wrapped his chain around a head and had to dive the anchor when they were leaving). We never used the alternative ISP (I think VCX) as another geek cruiser said they lost / fired their network guy and the system was quite problematic at the time often having a 50% packet loss. Unless you are sitting on top of the various hotspots for Blue Sky (McDonalds, Sadie’s, DDW, etc.) don’t expect any awesome speed. On the boat I would have burst to 150 mb/s but for the most part I was at 20- 60 mb/s. On Elysium we use a high gain antenna system from Island Time Wifi that allowed us to share the connection to the tablets, phones and computers aboard. With the Blue – Sky wifi there are some issues to be aware of. First, if you purchase data on a tablet it is only good for 15 days, not 30. There is as of this writing no 30 day data package and to add more data you must take the SIM card to the Blue Sky kiosk or their store and have them add more data. It is not possible to do online. Obviously as time transpires I would assume this will change. Second: if you use the Blue Sky wifi (which is the best deal) the connection is time bound, not data bound. And although you can purchase the time in a day, a week or one month increments you can easily extend the time by logging out when you are not using the network. We easily had our month card working for 6 weeks and we had a lot of time left when we left. When we left we gave ours to another cruiser so they could use it. So if you are new to the harbor you might wish to find someone leaving and politely see if they have any Blue Sky wifi cards they won’t be using. There are two areas to tie your dinghy, one by McDonalds on the eastern – south end of the anchorage and the other by the public ramp on the southwest end. Depending on the winds and the waves in the harbor each has their own good / bad characteristics. I have heard that the dock by McDonalds will sometimes lock the gate later in the evening but we never knew of that occurring while there. The dock on the SW end is used by a couple of local Tuna boats and can become rather messy at times. There was often a Taco night at the Mexican place on the corner by the park (SW corner dingy dock) but do not count on it happening. While the owner / employee’s are quite nice, about 1/2 the time they had private functions and didn’t reserve any area for the cruisers. Taco’s are a US dollar each ( I enjoyed them but some cruisers complained a wee bit about how their stomachs reacted to them), Beers 3 or 4 bucks. On Tuesdays a group of us walked around to the Pizza place on the N side of the harbor and for the most part it was a good value. There are NO deals here like in Mexico where you can feed a family of 4 for $5 ! We enjoyed Sadie’s by the Sea’s Goat Island Cafe, which is the old Rain Maker Hotel. It was priced a little more for the tourist but we found the food to be good, the view enjoyable, and overall a fair value. Boat supplies are next to non-existent here. Mee Won has the best grouping of small boat supplies but even there you are rolling the dice to find anything specific. At the Tool Shop; on the water front of the harbor, there was 3m 5200, and a good supply of general hardware; after all it is a hardware store. At the True Value across from Carl’s Jr (a typical fast food restaurant) we found chip brushes that were quite reasonable. 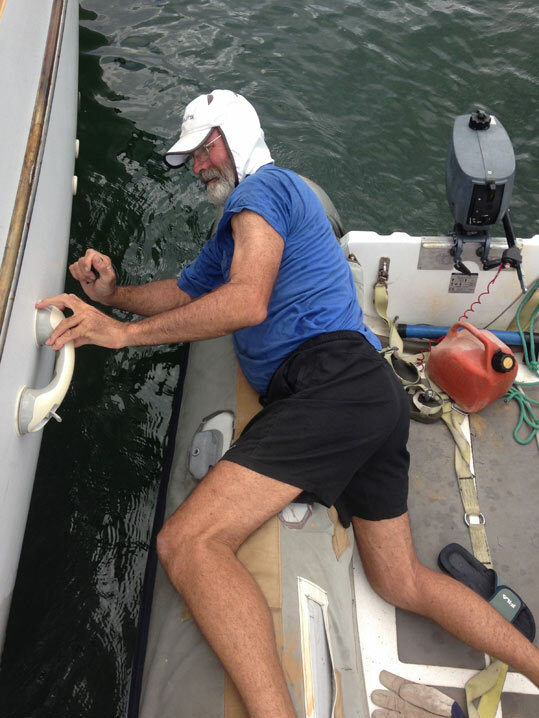 Steve on s/v Lady Carolina needed some new deep cycle batteries and there were none on the island available for purchase. It seems that for most parts people ship in whatever they need. The Yamaha shop only carried new engines and spark plugs. There are some boating products at the Purse Seine company and they are willing to bring supplies in for boaters that are more problematic to ship compared to the Post Office. Purse Seine told me that they have a container leave the states every two weeks and I could order and ship through them. Total time to order and receive I don’t know but they are worth looking into. You can find some stuff for yachts there but they mostly supply the Tuna fleet and the boating supplies there are big, Big, BIG! I did pick up some spare small shackles and some diesel fuel conditioner as well as some oil pads. However; you don’t buy most products individually as we had to buy 100 oil pads! Shackles and fuel conditioner were sold individually but any line is all by the spool! The local transportation is quite good and the vans / busses are each unique. Ask the driver if they are going by where you wish to stop and they will make sure you arrive there. Ask them too about returning or you may have a bit of a walk to catch the next bus as they will often go out of their way to drop you at the door. Cost-U-Less will provide you with return transportation if you spend $300 or more. You must check with the manager; Mr Benson, prior as that service is not always available and while W/ and Carolina received one ride on a Saturday they say the service is only Monday through Friday. It may be that they spent way more then the $300 minimum and it does make the trip easier and more fun with other cruisers. Of course when you combine a couple of cruisers who are preparing for the land of less, jt becomes quite easy to spend a LOT more then $300 and Cost U Less is much happier taking one trip. W/ and Carolina would take a bus to KS Mart (another good grocery), purchase what they wanted there, walk to Cost -U-Less and purchase the bulk of their supplies there and then get the gratus transportation back. One caveat is make sure you have money / and or make sure the credit card machines are working. While we were there the credit card machines were on vacation for a week. Business’ had to turn away any CC purchases during that time. However some of the ATM’s still worked. We used the ATM exclusively at the Bank of Hawaii. We’re not sure how long that bank will be there as I understand they are wanting to pull out of AS. Should you be planning on working in AS and want an account you must open it up in Hawaii as the Bank of Hawaii in AS is not opening any new accounts. The only bank remaining will then be the Bank of New Zealand. There are two ATM’s in the bank of Hawaii but only one ever worked during our stay. If you stop at the ATM during the day expect a line of between 3 and 18 people and some individuals will use multiple cards to get their cash. While there are ATM’s at the NZD bank, the Carl’s Jr mall, the airport, and the hospital, the one at the Bank of Hawaii had the cash more often than any of the others. Only once while we were were there was it out of cash and the others seemed to be out of cash more than not (reports from locals). We wanted to hike the national park some and unfortunately while there we either had boat errands that needed to be completed during the nice wether or we had inclement weather and didn’t wish to go mudding on the trails. To hike to the top of one of the mountains and have no view was not on any of our lists. May your stay be more pleasant than ours. As I said, when people ask us where our favorite place is I can not say; but should they ever ask where our least favorite place is I now have an answer.